If you've been toying with thoughts of a tonneau cover and Diamondback tonneau covers comes to mind then you have come to the right place. I will try and give you all the information you need to know to make the right decision on a Diamondback tonneau cover for your Dodge, Ford, Chevy, Toyota or Nissan pickup. 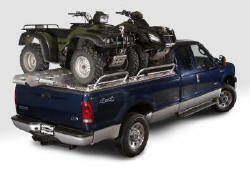 Sometimes you need to haul your ATV to the woods for that weekend deer hunt ... so how do you haul it? You would normally have to haul a trailer that can be a real hassle. The fiberglass hard tonneau covers require at least two people and then you have to be real careful not to scratch the paint. The Undercover tonneau covers are made of lightweight structural foam plastic and is easy to remove and reinstall but you still have to put it somewhere but the only tonno cover that you can actually haul your ATV with is a Diamondback. Next in the category of "tonneau covers for trucks" would be the soft vynal models like Extang tonneau covers. These all have a frame that is clamped to the truck and the vynal snaps to the frame (no holes in the truck). Extang also has a model that lifts like a hard tono. They're inexpensive and keep your stuff out of sight and out of the weather. The drawback is that they they aren't really "lockable". Some brand like the Access tonneau cover have what I call a "locking" quality but a razor can get a thief into any of the soft models. Now we come to the category of truck lids that are lockable and you don't have to take them off when you have that load that just a little taller the your bed. The popular Roll n Lock bed cover is called a retractable tonneau cover because that's what it does ... retracts! There is a 10' x 10' canister that holds the whole thing. Rolled up and out of the way in seconds ... back in service just a fast. The Roll n Lock's aren't 100% water tight. You will get a little dribble down your tailgate in the corners that runs out the crack between your tailgate and the bed ... usually not a problem. The new kid on the block in folding truck tonneau covers is Fold a Cover. These have the same advantages as the retractable units but the operation is just a little different. Instead of rolling up and into a canister they "fold" up and are out of your way in seconds and back in action in the same time. The four panel design opens 3 ways and stacks to only 3'' in the open position. Lockable too! One thing that all tonneau covers have in common is a gas mileage improvement. That's right. Up to 9%. A well respected magazine (Popular Mechanics) ran a test with an open bed truck verses the same truck with a tonneau cover and resulted in 9% BETTER GAS MILEAGE. Apparently driving with an open bed is similar to towing a parachute behind you and robs your mileage. These things can pay for themselves eventually ... maybe sooner if gas prices keep going up and the diamondback tonneau cover is the way to get this done.